1000 Watt Super HPS and 1000 Watt HORTILUX BLUE have been paired up in this all-in-one grow lamp. 1000 Watt Dual Arc offers the exclusive HORTILUX BLUE spectrum whereas all other brands only offer a standard Metal Halide spectrum. Studies have shown the most productive method for indoor growing is by starting plants with Metal Halide and then switching to High Pressure Sodium grow lights. The result of the Dual Arc is more compact plants and vigorous flower and fruit production without the need to purchase a Metal Halide and a HPS lamp separately. Dual Arc provides quality results for first time growers and is the best, all-in-one grow lamp. Hearty flowering & fruit production from one light source. Great for first time indoor growers. Produces safe levels of Ultra Violet (UV) light. Combines BLUE MH & Super HPS in one lamp. 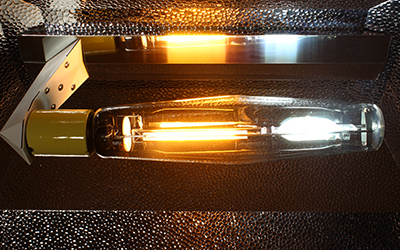 No other Dual Arc lamp offers a Daylight MH spectrum.